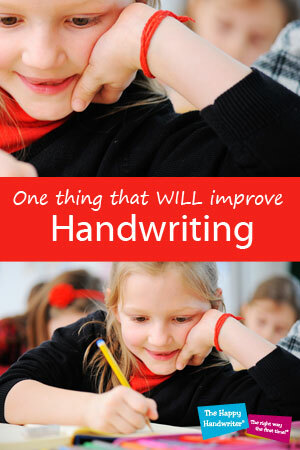 Tips for Improving Handwriting: Stabilise the Page! When looking for tips for improving your handwriting and the mechanics of good handwriting, there is one thing that WILL improve handwriting. Every time! And that is stabilising the page for handwriting. When the page is not stabilised with the helping hand, it is going to move around and make handwriting difficult. So, our children who are inherently problem solvers, are going to find a way to hold the page still. And they do that with their writing hand. This causes a big problem! If you are trying to achieve the handwriting motion which includes the movement of the thumb and fingers, the subtle wrist movements, and the progression of the hand across the page; while at the same time the hand is trying to hold the page still, it is going to cause a problem. The child is not going to be able to achieve the natural handwriting movements, and compensations that creep in are going to compromise speed and quality of handwriting. The hand cannot be still and move at the same time – it is one or the other. So many of our children neglect to stabilise their pages while writing. 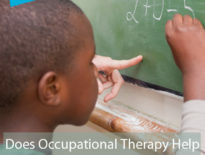 Mary Benbow, one of the great researchers into handwriting and on whose principles occupational therapists base so much of their work with handwriting intervention, said that the greatest indicator of bilateral integration is that a child displays an inherent ability to stabilise the page while writing. Poorly developed bilateral integration is one of the reasons why children avoid stabilising the page. The assisting, or helping hand, seems to sit there like it has no idea that there is a job that it could potentially do – a very important job! Another reason for a lack of page stabilisation is poor postural stability – but neck stability in particular. Heads are heavy and if the muscles are not working well to hold it up, the child is going to have to find a way to support it. And the helping hand is the one that comes to the rescue. 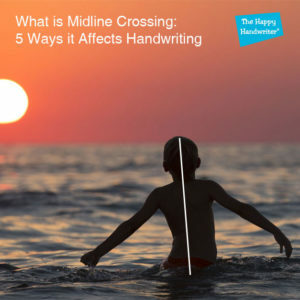 We are so familiar with children who support their head in their hands while writing and this becomes a problem for the development of handwriting patterns. This compromises stabilising the page for handwriting! Neck stability does need to be addressed but that will have to be a subject for another day – it belongs in Part 2 of The Wall which so many of you are “gently” reminding me to get published! If the supporting or helping hand is not holding the page still during writing tasks, the preferred hand is going to be in trouble. Not only will it have to control the pencil for the formation of letters for handwriting, but it is going to have to stabilise that page as well. As amazing as our hands are, there is a down side if the hand has to perform two tasks. If the hand has to stabilise the page, then it compromises the development of pencil control and bad patterns are developed that will almost certainly compromise legibility of handwriting. So, when it comes to good handwriting tips, this is one to pay attention to. We also need to focus on bilateral skills. Activities that our children will not be able to master unless they have two hands available and working together co-operatively. We do need to start on the gross motor level – the large body movements that require the co-operation of both sides of the body. Our children need to climb, run and spend time exploring playground equipment. These are gross motor activities that cannot be done without using bilateral skills. And then we need to move to the more refined bilateral tasks – the bilateral hand tasks that are going to prepare the foundations for page stabilisation during handwriting. We are looking for toys and activities that are engaging and drive participation, but cannot be done without the use of both hands. Wikki stix will always be one of my favourites! They are simply irresistible and they cannot be used without the co-operative use of both hands. And then there is the squiggle pen. This takes bilateral skills to the functional level we are looking for. Stabilising the page. 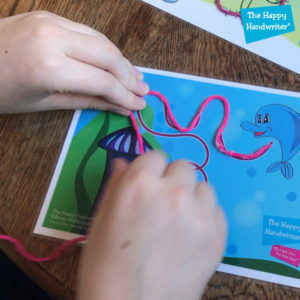 The appeal of the squiggle pen, which may even trump the fascination of technology and the tablet, requires the child to stabilise their page if they want it to work properly. Stabilisation of the page also comes down to habit. In just the same way as the teacher reminds the children to put their feet on the floor and tilt their books to get a Crocodile Mouth®, holding the page with their helping hand needs to be on the list. Research studies have shown that it can take more than two months for a new habit to become automatic! 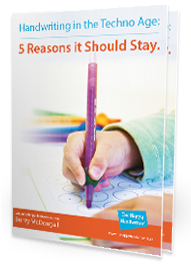 That is a long time for our weary teachers to keep on reminding our children, but it does show that we need to take a long term view on establishing good handwriting patterns. 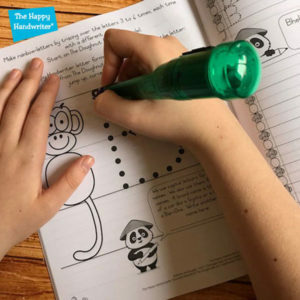 Stabilising the page for handwriting really is a critical aspect to achieving fluid, legible handwriting, so we need to put it up there as one of the priorities for the early phases of learning to write. Habits take time to be established and we thank our teachers who are at the forefront for this. Our children need constant reminders to stabilise their page with their helping hand. When our children stabilise the page during writing it can have a dramatic impact on handwriting speed and quality. Engaging in bilateral hand skill activities can assist in laying the foundation for this. Pop over to our shop to explore our bilateral hand skill activities – see you there! Joanna over at Kid Sense Development looks at handwriting performance and the role page stabilisation plays in that.